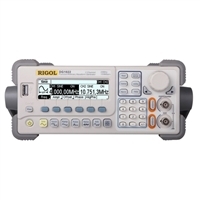 Rigol DG1000 series function/arbitrary waveform generators use Direct Digital Synthesis (DDS) technology. They can generate accurate, stable, clean, low distortion signals. Advanced Direct Digital Synthesis(DDS) technology, 2 output channels, built-in counter, 20MHz maximum output frequency (5 MHz max square wave). 3.5 standard waveforms and DC outputs. 48 preset arbitrary waveforms, 10 groups of 4kpts arbitrary waveforms. Multi modulation functions: AM, FM, PM, FSK, and linear/logarithm Sweep and Pulse train waveform outputs.